Is it time to upskill your team? For any manager who wants to improve team morale while boosting retention, upskilling employees is the ideal solution. Whether you own a bustling bar or manage several pub locations, there are plenty of ways to upskill your team for a better customer experience. Here’s what you need to know. While more informal than hiring an expert or paying for team members to take a course, mentoring at work is a great way to upskill employees without loosening the purse strings. All it takes is half an hour one day per week to shadow your team member and teach them a new skill. It could be a technical skill like working the register, or something as simple as teaching them how to upsell customers in a way that isn’t pushy. If you don’t have the time to spare yourself, considering using one of your more experienced workers to train up newer employees. It will not only build a more cohesive team, but it will empower the ‘trainer’ to take on a more responsible, managerial role – a way to upskill them without lifting a finger. When small business owners think about upskilling employees, it usually means shelling out hundreds of dollars for training – money that probably isn’t in your budget. But thanks to the explosion of online resources, you can now get your team members upskilled without spending a cent. There are heaps of free training resources online that can boost the skills of your hospitality employees. Spend a bit of time Googling for the best websites, and then give your team members some homework for the week. You could even incentivise the process by mentioning that any self-taught skills will be considered for a pay bump at their next annual review. Beyond learning new things online, your employees can use the internet to improve their work lives. Teach them how to use an online solution to apply for leave and manage their timesheets – so you don’t have to. You can even start using an online communication tool where you can stay in touch with your whole team no matter where they are. Posting messages about upcoming work events and announcements has never been easier – and it’s a useful skill everyone on your team will be able to learn. When you want to take things up a notch – because, after all, your employees are the beating heart of your business – you can take advantage of traineeships and apprenticeships. Give your team the skills they deserve by investing in their future. Upskilling employees in this way is also a great strategy to improve retention. If you show your team members you truly believe in what they can do, they will be more likely to stay with you over the long term. And best of all, you don’t have to lose workers for months at a time while they are away studying. Plenty of traineeships now take place online, so employees can learn new skills when they’re off the clock. From workplace mentoring to online training courses, investing in the future of your employees is guaranteed to pay dividends now and in the long run. The post Is it time to upskill your team? appeared first on Deputy. Clearly, the employee review questions and the format of annual appraisals may miss the mark in terms of improving employee performance because of the stress involved. Traditional performance reviews focus on past failures rather than future development. As a result, annual appraisals are counter-productive in terms of improving how employees perform. Despite the immense amount of paperwork that’s involved in annual performance reviews, the feedback is normally limited and outdated. This explains why 50% of survey respondents stated that they would scrap the annual review. If your business fails to meet these demands, it will be difficult to empower employees to improve performance. Adopting modern ways to improve employee performance will empower workers and will facilitate the focus on encouraging multi-channel and regular feedback. Purpose – Explore the reason for the employee doing the work and assist them in achieving their purpose. Autonomy – Involve employees in setting goals and objectives. Well-timed feedback – Provide timely feedback on a regular basis (formally or informally). Transparency – Design your performance management process as clearly as possible, so that employees know what to expect. Growth – Prioritize your employee’s career progression, growth, and development. After you’re aware of the areas that necessitate updating to make the biggest impact, you’ll be in a better position to implement modern ways to improve your employees’ performance. When onboarding new starters and training current workers, employee engagement should become a top priority. Given that highly engaged employees are 22% more productive, it’s a proven method of improving employee performance. Engaged employees have enthusiasm and passion for their work that translates into better business performance. On the other hand, disengaged employees are generally unhappy at work and portray this unhappiness by creating problems and trying to undermine management and the team. Focusing on disengaged employees to improve performance can be an uphill struggle. However, this is an area that you need to get to grips with if you want a thriving business because, according to Gallup’s State of the American Workplace report, only 33% of U.S residents are engaged at work. If you want to implement proven strategies to boost your employees’ engagement, download Deputy’s Employee Engagement eGuide. This 13-page guide gives you seven ways to encourage employee engagement while enabling you to concentrate on generating more revenue and profits. What is the achievement that they are most proud of? Which aspects of the role would they change and why? In what ways has the job changed since the last assessment and how have these changes affected them? Research by the American Psychological Association found that 93% of employees who feel valued are motivated to do their best work. Therefore, taking a collaborative approach will help to improve employee performance because your employee will feel like their opinions and contributions count. Holding mini-meetings can save time in the long run because employees feel supported instead of being left to their own devices. In turn, managers will spend less time dealing with issues that go wrong because they’re up to speed with their employee’s progress and challenges. Relationship-building – Managers and employees are able to strengthen their relationship when the message (that they’re working towards the same goal) is constantly reinforced. Productivity – Check-in meetings will reduce the time that is spent going back and forth by email and on other informal conversation. Feedback – Managers can give their employees’ real-time feedback about their performance and provide the opportunity to course-correct in a timely way. Transparency – Check-in meetings build trust between managers and employees. Where managers have a track record of following through with the actions that have been agreed upon, employees begin to trust that the manager will deliver on their promises. Games are a useful way to build team morale and to encourage employees to let their hair down at work. This relaxed atmosphere helps to create stronger bonds between colleagues. Traditional games, like a Lego tower challenge, are fun and easy. However, a modern way to use games to improve employee performance is through gamification. These games are used to achieve a specific business outcome, like sales training. Gamification involves the use of game technology via a website, service or application to drive employee participation. LivingSocial and Spotify swapped annual reviews with mobile gamification and 90% of employees took part voluntarily. Ford (Canada) experienced a 417% increase in the use of its learning portal after introducing gamification. T-Mobile’s customer satisfaction increased because of the use of gamification which helped to motivate its employees. The concept of a 360 review is where employees receive confidential feedback from their colleagues. The process normally involves peers, managers, and direct reports completing anonymous feedback in relation to a range of key competencies. Traditionally, 360 reviews were only used when managers were under evaluation for a promotion or where there was a concern. The use of 360 reviews can be extended to provide a more balanced and less biased view of employee performance. Evaluating the results of a 360 review can become complicated and time-consuming if done manually. However, there are tools that assist in automating the feedback received. Software such as selfstir.com and spidergap.com measure anonymous responses, based on a rating scale. Using a 360 review tool provides managers with the insight to identify learning priorities based on feedback from those employees work closely with. Employees may receive the feedback from a 360 review more positively than comments from management. Realizing that colleagues perceive certain behavior in a negative light might provide the motivation to change and improve an employee’s performance. Providing feedback on the perception of team members. Addressing different skills, like listening, and planning. Focusing on character-based traits, like teamwork and leadership. Acknowledging and showing gratitude for the efforts of employees can improve performance. Researchers have found that a culture of gratitude is accompanied by higher job satisfaction. Managers who actively recognize employees for the work they have done well will encourage them to perform at a higher level. A study by the O.C. Tanner Institute found that 37% of employees said that more personal recognition would motivate them to deliver higher performance. Acknowledge your employee’s positive contribution both in private and in public, for example at the team meeting. Give a business-related gift, like a gift card, to say thank you. This token of appreciation should go above and beyond normal bonuses. Take the team out for lunch or to a special event to give them time away from the office and to show that you appreciate their efforts. Offer a gift certificate to a restaurant or for an activity that your employee would enjoy. Showing your employees that you’re grateful for their contribution will help them to become more invested in their work. The old-fashioned mindset where some employers believed that employees should be grateful for work is changing into a reciprocal relationship where managers show employees that they’re grateful for their positive contributions. Modern employees will need modern ways to keep them engaged and to improve their performance. Traditional approaches may be less effective as employees are more likely to demand more in terms of being fulfilled at work. An employee who is performing below par may stay at your company and erode team morale and even negatively affect customer satisfaction. In order to prevent this scenario, consider implementing modern methods using modern tools to increase your employees’ performance. You’ll require the use of modern software to assist in the improvement of employee performance. Employee engagement is key and your tools should have the functionality to keep all of your workers updated on the latest developments. A tool that improves employee performance will facilitate keeping your employees on the same page, even if they work different shifts and on different days. 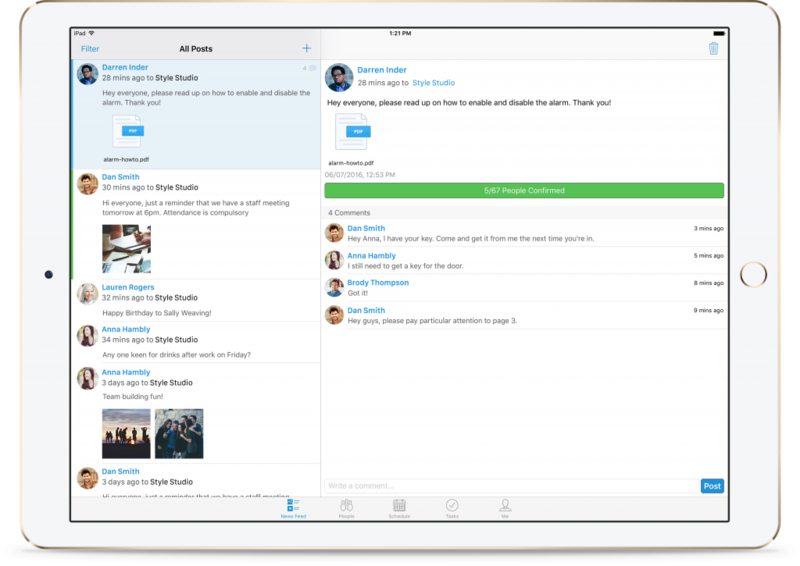 Deputy’s Newsfeed allows you to communicate with a group or an individual employee. Keeping employees in the loop – irrespective of how many hours they work – is an important aspect of making them feel valued. Book a free demo below to find out how Deputy can help you to modernize your communication with your employees with little effort. The post 7 modern ways to improve employee performance appeared first on Deputy. Preventing employee theft in the workplace should be a top priority for businesses. According to research, 75% of employees have stolen from their employers. The same study found that employee theft accounts for 42.7% of shrinkage while shoplifting only accounts for 35.6%. This is especially crucial for small businesses because they are more likely to be the victims of internal theft (64%). However, only 16% of small businesses report incidents. It’s reported that the FBI has found that employee theft, which they refer to as ‘shrinkage’ is the fastest growing crime in the U.S. American companies lose 7% of their yearly revenue to theft or fraud. A quarter (25%) of businesses suffered losses of more than $1 million because of employee theft. More than a third (37.1%) of total thefts was committed by a manager. One in three retail employees were arrested for internal theft. Rationalization: Employee has internal excuses, such as “the business won’t notice”, “I deserve a raise”, or “other people do it”. Time theft – Employees can get their friends to punch in and out for them to get paid for hours that they haven’t worked. Stealing time can also be done while at work. This is especially the case with employees who have access to a smartphone. Using phones or even work computers to message friends or check social media can account for a large chunk of time theft. This is perhaps not a surprise since people now spend more time on social media than they do eating, drinking and socializing. Cash and stock theft – Employees can steal cash by failing to enter the correct transactions through the cash register. For example, they can charge the customer extra, if the price isn’t displayed and the item isn’t scannable. The employee then keeps the excess. Theft of workplace stock can be done using personal bags, garbage bags or, in the case of retail, employees might wear the clothes before leaving the store. Employees can also enlist the help of a friend who returns stolen goods in return for cash. Vendor theft – Where employees have access to set-up and manage vendor accounts, they can abuse this position by setting-up fraudulent vendor accounts. They will then issue checks to the fake vendor and redirect the funds to themselves. In the case of large workplaces, employees could even set up a fake account for a staff member who has left. One way to make employees feel like you care about them is to offer them adequate pay. Research has found that higher wages are related to lower employee theft. Unfortunately, underpaid employees are likely to think about committing petty theft to even the playing field. Perhaps you could take a leaf from Target’s book and increase your worker’s wages, because this could not only help with staff recruitment and retention but also safeguard your store against internal shrinkage. Setting aside time to recognize achievements. Treating employees to perks to say thank you. Find out why the applicant left their last few positions. Confirm at local and state level whether it’s legal to do a credit check on your applicant. Credit issues could indicate financial pressure that may increase the likelihood of the applicant being tempted to commit theft. Ask applicants to do a drug screening. Be aware that placing security cameras in places where people have a reasonable expectation of privacy, such as restrooms and locker rooms, is illegal. Security cameras are the eyes and ears when you’re not around. Reviewing your CCTV recordings at regular intervals will help you to identify any unusual activity. Responsible employee shift scheduling can play a part in preventing workplace theft. Use workplace management software to ensure that there are at least two employees working at any given time. Use a system that makes it easy to replace a worker who is called out. Your workforce management tool should also have the ability to assign tasks to ensure that there’s more than one employee covering critical functions, for example, working on the cash register. You can also add tasks, like register counting before a shift and till balancing when an employee finishes work. This will help to prevent employee theft because they will be accountable for maintaining an accurate register. Keep a record of the times that the register has been short in relation to the same employee. You may have to terminate the employee if this is a pattern of behavior. Preventing employee theft in the workplace involves the business owner taking a proactive approach. Security cameras provide a level of reassurance, but showing that you’re on top of what’s happening in your business is one of the best deterrents. Carry out random, spontaneous cash counts at different times of the day. Your employees will be unsure about when the cash register will be checked, so they’re less likely to take the chance of stealing from it. Merchandise should also be audited on an unplanned basis. You should adopt this approach if you sell high-value goods. Review the number of returned or damaged goods to try to identify any unusual activity. Inventory management tools can help you to track suspicious merchandise trends. Checks issued and checks received. Ledgers for accounts payable and accounts receivable. Control too many aspects of any financial transaction. A study found that tips from other employees were the number one way that employers were alerted about theft in the workplace. Most employees are loyal and honest and they would feel aggrieved to know that someone is stealing from their place of work. Make it easy for employees to report their suspicions by setting-up an anonymous tip line. Ensure that every tip will be treated in the strictest confidence, so that there will be no repercussions for the employee who made the report. Consider outsourcing your whistleblowing hotline to help reassure your employees that they can relay their concerns in a safe environment. Be very clear about what will happen if it’s proven that your employees are stealing from you. Big retailers have the funding to prosecute thieves to the fullest extent of the law. However, prosecuting employees who commit theft isn’t so easy for small businesses due to the high costs involved. Irrespective of your business size, you need to be strict about following your internal theft procedures. There should be no leeway in following your disciplinary process when dealing with someone who has stolen from your business. You need to send out a message to the rest of your employees that theft – in any form – won’t be tolerated in your business. Your theft policy should be part of your employee’s signed contract so there will be no excuse for not knowing about the punishment. You should also reinforce your internal theft policy during team training. It’s your responsibility to undertake a thorough investigation before any accusation is made. Business owners need to tread carefully since false accusations can lead to lawsuits. It’s always recommended that you seek legal advice before dealing with the employee under suspicion. The tips above will help you when trying to prevent employee theft in your workplace so you can focus on growing a healthy business. The post 7 tips for preventing employee theft in the workplace appeared first on Deputy. You can have the finest brochures and the best products, but if you don’t have well-trained and flexible hourly workers you could lose customers as well as have an unhappy, unmotivated staff. It’s vital that your staff has the training and talent to successfully represent you. Employee development is about more than picking up a few skills. It’s also about increasing employee morale and building a strong business. If they understand the points below and put them into action, you will have employees who excel at what they do. It’s easy to learn product specifications and details, but what your staff really need to know is what makes your products stand head and shoulders above the competition. What sets your company apart and makes it special? Make sure your staff knows that you believe in the company and its products, and they will too. Encourage your hourly workers to give you updates on their progress in their own words on a regular basis, whether that’s in a team meeting every month, by email each week, or a quick daily chat. Give your staff an easy way to stay informed, share important messages and contribute to the workplace conversation. Deputy’s workforce management app gives users a News Feed, which can replace emails and text messages as a way to communicate with all of your employees. The News Feed feature allows for easy communication between you and your employees through one central location. Your hourly workers should make every hour count. Using a time management software like Deputy can help you and your busy employees manage their time and improve efficiency. The right time management software will also allow hourly employees to clock-in and clock-out online, allowing managers to to easily view and approve their hours worked. Don’t allow your staff to underestimate the value of each and every customer, no matter the size of the account. Every customer should receive the same excellent customer service. Your hourly workers should take the time to understand how to ask a good question in order to get the answer they need. These questions can be for customers, for co-workers, or for you. Ukwritings can assist them with formulating these questions, while Easywordcount can help them ensure that the questions to ask are succinct and to the point. Some chat among hourly workers is inevitable, but this should never turn mean-spirited or border on bullying. It is your responsibility as a manager to listen to what your employees are talking about, to discourage gossip about colleagues, and never engage in it yourself. Your staff should understand how to network and meet the influential people in your business. This includes not only meeting them in person but also communicating with them by email when necessary and providing coherent and useful feedback on practical ways to improve the company. For guidance on business writing, Essayroo is useful for assistance, and State Of Writing is an excellent resource. Make sure that your hourly workers have experience in giving presentations which are informative and exciting. A great tool for assistance with speech writing is Boomessays, or they can check that their grammar is correct at Grammarix. Your workers should be able to think on their feet. Applaud creative approaches to even mundane issues, because these unique approaches will keep them (and you!) ahead of the competition. It’s vital that staff learn to prioritize and get important things finished first. A great tool for keeping them organized and efficient is the work tracker Asana, and they can also track their time and tasks on Trello. Practicing daily kindness, reliability, and patience will take them a long way toward being a successful hourly worker. Model these behaviors for your staff and they will reflect them back to you. A confident worker recognizes and develops themselves, speaks with authority, and has pride in their product and the company they represent. Your people should believe that they are the best at what they do and that they work for the best company ever. Customers will, in turn, believe in your employees’ confidence and in you as a company. Ask your workers, from the beginning of training all through their career, to tell their stories about how your products perform and how they deliver excellent customer service. Make a point of it to share these stories with your staff. Recognize the evidence of your success and the customers’ happiness. By emphasizing these skills in your workers, you can lay the groundwork that encourages effective interaction and consistent work-life balance. The positive results of a well-trained staff can be seen not only in the increased productivity and effectiveness of your employees but also in the minds of your customers as they leave with a positive view of your establishment. By encouraging your staff using these tips, you will ensure the success of your business in the day to day operations as well as in the long run. The post 13 essential skills your employees should learn appeared first on Deputy.